Luckily work’s been busy this week, so I have yet to have “farm day”. But I did sneak out this afternoon and looked at the garden. Everything is growing nicely as far as I can tell. I harvested a half-dozen radishes. Something about our radishes, they never look round like you see in pictures. Maybe I’m leaving them in the ground too long, but ours end up looking like mutants. I guess they taste okay. I’m not sure what we’re going to do with them all though. I can mail some out to you I suppose. I also picked our first two cucumbers. There are a dozen more already on their way. And I got another handful of green beans too. Wednesday is CSA day, so we’re on the verge of having way too many veggies. Last night we cooked zucchini, snap peas, green beans and squash along with oregano and parsley. All that on top of pasta with some garlic, pepper, salt, and other spices. It was okay. But I find I need some sort of meat in there, otherwise I start to gag. 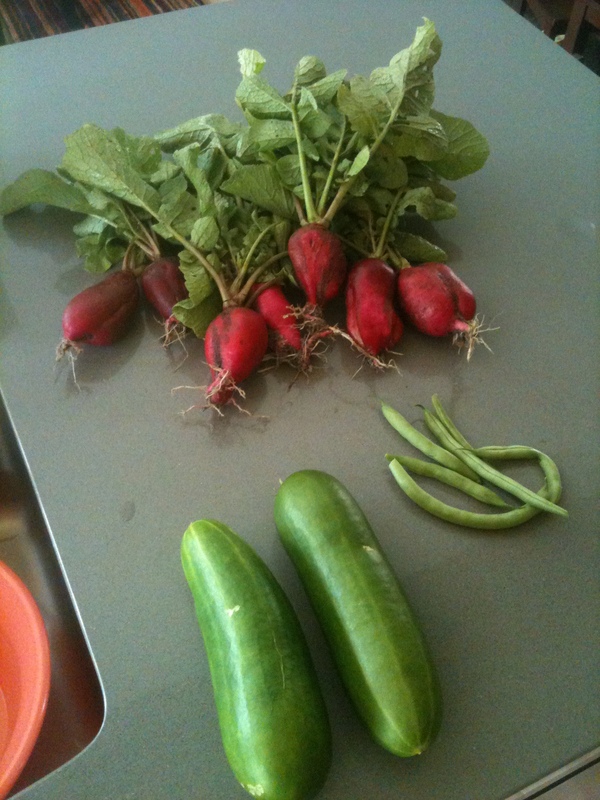 This entry was posted in Garden, Green Living, Living There and tagged harvesting vegetables, land by Chris. Bookmark the permalink. I agree with you, I need meat in at least two meals a day. Actually I need a starch too, followed by something sweet. The only thing I can go without is the veggies (not to say I don’t enjoy them though.) Regarding your last post, I too am trying a trellis for my cucumbers this year, fingers crossed that it works! I’ve got a TON of flowers (and growing veggies) on our cucumbers, zucchinis and squash. I have to be careful tying the cucumbers so I don’t knock off the flowers.